Climbing on the island of eternal spring. Tenerife – for many retirees the second home to hibernate, for short term tourists a place to party, relax and catch some rays. 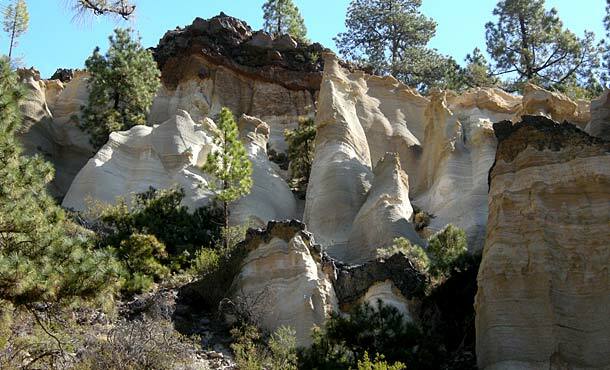 Sport climbers in turn know this Canary Island in particular because of its number of Barrancos. Those dried-up river valleys often wind their way through the very beautiful landscape and offer a great variety of sport climbing routes as well as countless boulder spots. 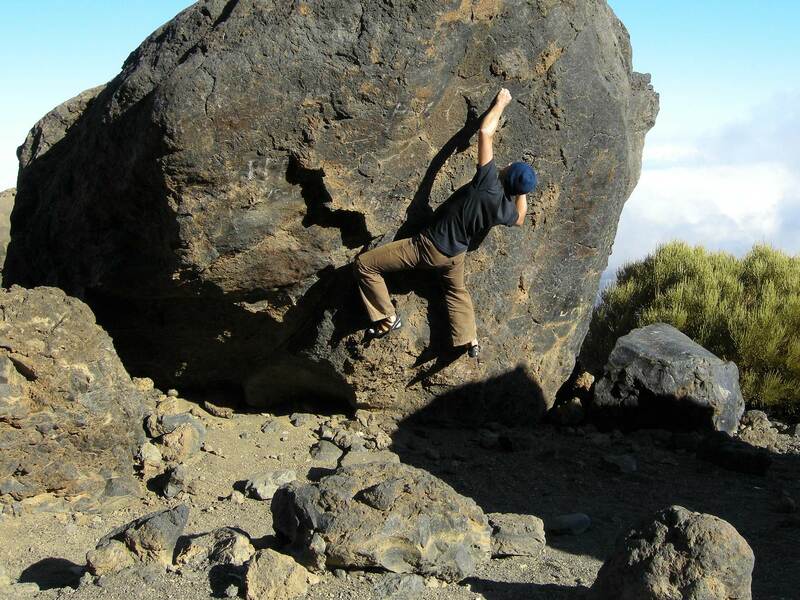 The undoubtedly best climbing areas (Arico, El Rio and Las Vegas) are located in the mild and mostly sunny south of the island at Granadilla and are hardly exposed to the winds. We also spent some time for acclimatization in those canyons. Most of the Barrancos are very easy to reach and also if they don’t vary that much in their landscape, they still offer a great number of excellent routes to climb. Understandable that it attracts sun-spoiled sport climbers in the wet and cold winter months. However our plan on Tenerife was to climb alpine multi-pitch routes on the biggest rocks in the volcanic caldera of Mount Teide.  We have heard that this is possible, but there are just a few information about it. 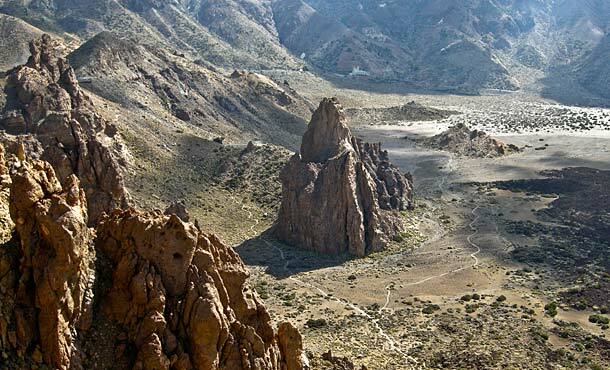 Beside this Mount Teide offers a lot of superlatives: it is the highest mountain in Spain with a height of 3718 m and its caldera with a length of 17 km in diameter is one of the largest in the world. 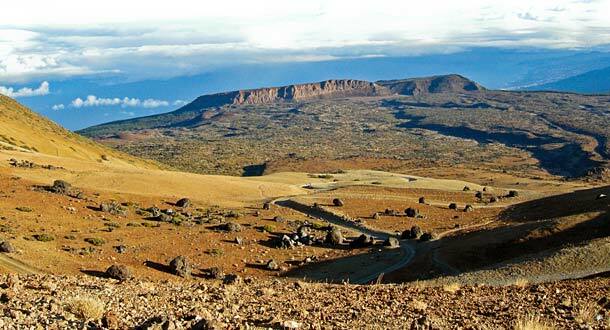 Inside the caldera, there are breathtaking stone deserts as well as stunning rock and lava landscapes. It is a mystery to us why it doesn’t attract more climbers. Maybe because of the adventurous protection of the routes, which have significantly alpine character. However, because we seek the adventure, we are dead right. We had been infected daily by the caldera with its fascinating volcanic landscape. Our first goal is La Catedral. Its west face is the highest wall in the caldera. To climb on those odd structures (orange-colored basalt in horizontally stratified flow direction) is a lot of fun. The giant shows us its teeth with its very challenging routes. Also the orientation in the upper part of the wall isn’t easy. It takes a lot of creativity in order to find a way to the summit. 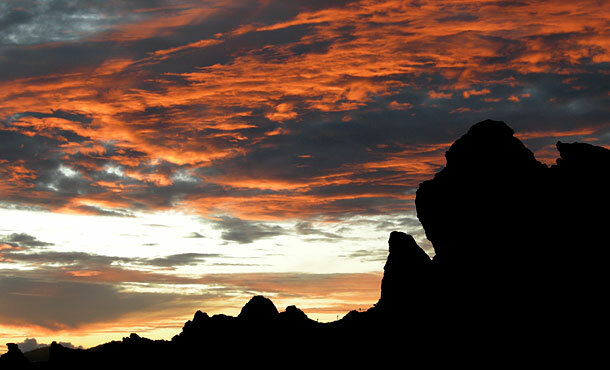 Once at the top, we are fascinated by the great climbing and the opportunities that exist on this rock. In the coming days we climb a lot of routes on the surrounding rocks of the Cañada Blanca: the Roques de Guillermo, Roques del Queso and Félix Méndez. They all have one thing in common: they offer great movements on surprisingly well structured volcanic rock, a unique location within the caldera, overlooking Mount Teide and a great tranquility. During the ascent of Mount Teide, we found some fantastic spots for bouldering. First of all there are the Los Huevos del Teide (Teide eggs) on the north side of the 2745 m high Montaña Blanca. As if a giant rolled the dice, it has a whole field of jet-black glossy lava balls scattered on a light beige pumice hillside, which offers a wonderful contrast. The Huevos with a diameter of up to 5 m have been solved from the liquid lava and formed during the rolling to balls. One hour further up you get to the fine vantage point of Estancia de los Ingleses (residence of the British), from where one can overlook the Huevos del Teide. This flat spot with huge rounded boulders offers some excellent bouldering. In this atmosphere bouldering was so much fun. For the last three weeks we have enjoyed the diversity of mountaineering on the island with all its benefits, and explored the fascinating alpine side of Tenerife. Take the airplane to Tenerifa Sud, than hire a car (better than motorbike) to get around the island. 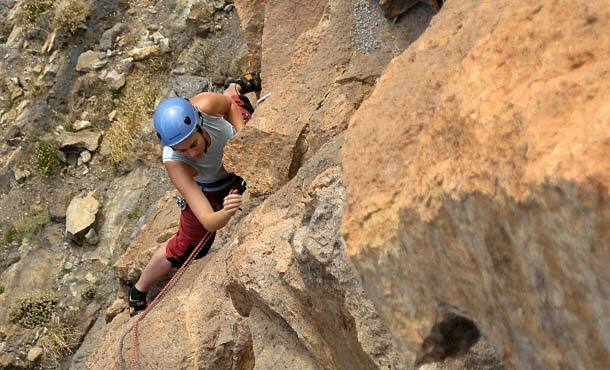 The sport climbing areas at Granadilla and Cañada del Capricho offer baseclimbs up to 35 m, the alpine routes of Cañada Blanca are 3 – 4 pitches long on different rock structures, from pumice with lots of pockets to smooth volcanic stone. 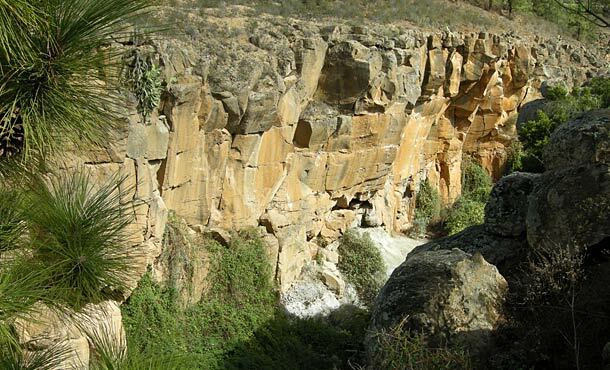 The bigger walls of Cañada Blanca at a height of 2100 meter offer alpine climbing style. You will find any type of piton – from the worst piton dummy, Rivets/Burils and can clip to a brand new Petzl-stainless-steel-bolt. Camalots for protection are highly recommanded. 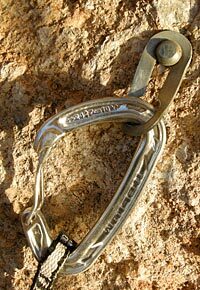 Rappel anchors are often very unfavorable drilled. In Vilaflor you’ll get the best Barraquito on the whole island at Señora Araceli and Jesús’ restaurant “El Rincón de Roberto” (note: Barraquitos are never on the menu, so you have to ask for it).